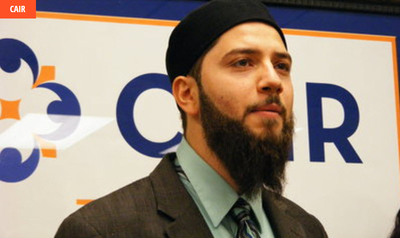 Islamist Watch published an article in the Daily Caller last week about a conference in Virginia organized by a group named Khatme Nubuwwat (KN), an international network dedicated to inciting violence and hatred against Ahmadiyya Muslims, a peaceful Islamic sect hated by Islamists. Conference speakers declared that Ahmadi Muslims are "infidels," claimed America is a "land of infidels" and glorified violent jihad. Read our article for more information. This behavior would shock most Muslims. But not America's leading Islamists. "May Allah reward you guys. You guys are doing very important work... and you shouldn't be bullied by somebody who's upset because they have a fringe opinion that is heretical...You are well within your right to do that. You are doing very important work. I am envious of you. ... What a blessing. What a blessing. If there's anything we can do to support you in that effort, you could definitely count on us..."
Another prominent Islamist, the Georgetown academic Jonathan AC Brown, also denounced Ahmadi activists for the sin of criticizing a group that wants to murder them.